The "Wilf Seymour", en route from Pointe Noire to Oswego, pushing the barge "Alouette Spirit", suffered a steering gear failure in position 045 13 22.5 N, 074 03 12.3 W about 2,2 miles west-southwest of Pont Saint-Louis on the Beauharnois Canal, Quebec, on nov 27, 2018, at 10.05 a.m. The tug and barge exited the channel, and the barge ran aground. The "Wilf Seymour" suffered a problem with the starboard-side main engine in position 046 53 15.6 N, 070 55 19.8 W, pproximately one nautical mile northwest of Saint-Michel-de-Bellechasse, Quebec, on Oct 30, 2018, at 8 a.m.Consequently, the tug was forced to reduce its speed. However, the vessel was still capable of using the port-side engine. After repairs were made, the vessel continued its voyage. 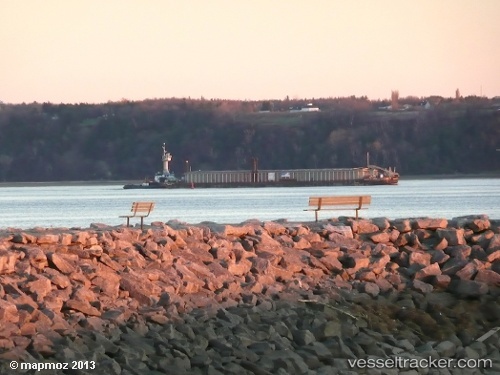 The operation to refloat the barge "Alouette Spirit" on the St. Lawrence River, where it ran aground on Dec 25, 2017, being pushed by the "Wilf Seymour", has started, and it may be back into deep waer next week thanks to the rise of the water level. The salvors were transferring a part of the 13,000 tonnes of aluminum ingots it was carrying to another barge. The bailout plan submitted by the owner of the barge McKeil Marine has been approved by Transport Canada and the Coast Guard durnig the recent days. After several failed salvage attempt, the owner had decided to wait until the end of March for the water level to rise before refloating the barge.